Instantly create professional ID cards and badges on windows PC? 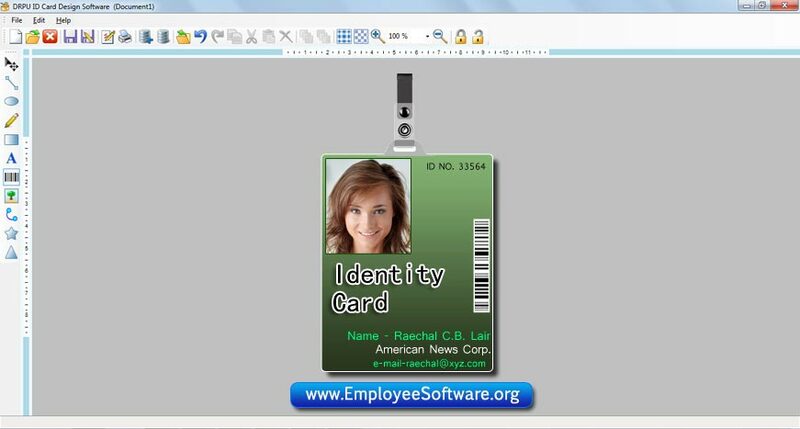 Use ID card designer utility that allows user to generate printable and readable employee identification cards integrate logos, employees name, company name, contact details, photos etc in simplified manner. Comprehensive ID card designing program provides image designing tools such as Text, Ellipse, Barcode, Picture, Star, Line etc at affordable price. Technical powerful ID card creater program colorful and high resolution ID cards in customized format without any others hands. Advance featured ID card maker application generate beautiful and professional business cards and provides option to specify size, font, color, shapes and pattern in easiest way. Cost-effective and proficient ID card maker and label designing software create ID cards in Rectangle, Rounded Rectangle, Ellipse and other shapes. Innovative ID card creater program provides advanced printing options to generate multiple security identity cards on single paper within minimal efforts. Reliable card designing and generator program craft organization membership cards, student library cards, ID cards etc using barcode advance settings. Extraordinary ID card designing software generates informative identification card of students or employees incorporate with various personal information of each member of college in effective and efficient manner. * Professional ID card maker software provides support adding of various advanced security features including digital fingerprints, photo and electronic signatures on identification card. * Identity ID card creater software facilitates user to import images from PC files or use inbuilt image library while creating picture professional ID card. * Award winning ID card creater software enable user to save generated ID cards on any computer location in various image file formats like jpg, jpeg, etc for future uses.